Smile Cliniq gentle Dentists are experienced at treating dental phobics and have been certified by Dental Phobia in recognition of our caring service tailored towards dental phobics. Dental phobia can be terrifying. You may avoid going to the dentist, even if you have toothache. If your teeth are ‘in a state’ you may be embarrassed by bad breath or the appearance of your teeth. Have you stopped smiling? Do you hide your mouth with your hand while you’re talking? In the end you may have avoided going to the dentist for so long that you are afraid to go because you cannot face being told how much treatment you need. You are not alone! Up to 50% of the adult population report some level of dental phobia. Fear of visiting the dentist is a completely understandable human emotion, and affects many people in varying degrees around the world. Often the best way to overcome this fear of the dentist is to think about where it originated from and to confront it. Some people suffer because of a previous bad and painful experience at the dentist, and are anxious about repeating the experience. Many others may have heard horror stories from friends or colleagues or fear the lack of control that they will have during their treatment, and are put off because of this. But it is absolutely vital to remember that you are not alone, dental phobia and teeth anxiety is extremely common across all kinds of people, male or female, young or old. There are many options available to you to try and overcome this as best you can, and many people that you can talk to who have had the same experience as you and know what you are going through. It is crucial to talk to your dentist beforehand and explain exactly how you feel, they are trained to deal with nervous patients and will be more than happy to help you. Please, please whatever you do, do not let dental phobia stop you from visiting the dentist. There are so many avenues open to you, stopping visiting the dentist will result in your oral health suffering, and could result in much more lengthy and painful treatment than you avoided in the first place. Once we have a detailed understanding of your problems, we can start to introduce dental treatment. This begins with simple ‘experiments’ such as sitting in the dental chair for the first time. Treatment is gradually introduced at a rate you can cope with. This can be done in many small visits or in longer sessions. Treatment under sedation is also available. Please remember any time you say or indicate you are uncomfortable we STOP. Distraction techniques (such as watching a good film!) are your dentist’s way of helping you relax in the practice. At the same time, they are also your dentist’s way of getting to know you as a patient. The better a dentist knows you, the more effectively they are able to treat you. This is true for most people, but even more so for phobic patients. If your dentist understands how frightened you are, they will be more understanding and responsive to your requirements. Nowadays, many dentists are trained to offer help, support and advice to patients who suffer from dento phobia. One of the key techniques that dental professionals have become more skilled in over recent years are distraction techniques. These techniques are designed to help dentists find ways to relax patients, to keep their mind off their phobia and to help manage their teeth anxiety. We have TVs in every surgery to help you to relax and look program of your choice while having treatment. Smile Cliniq is an ideal place to come if you are phobic but care about your oral health, dental treatment is on a fee per item of treatment basis. You will get a written and costed treatment plan. 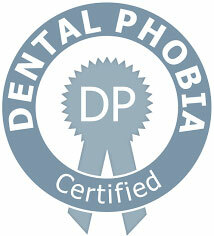 We are also Dental Phobia Certificated to treat phobic patients with a fear of the dentist. “Since childhood I have always been a very nervous dental patient and following a bad sedation experience in my mid-teens I was overly anxious and prone to panic attacks just at the thought of a visit. The surgery itself & the sound of the drill was too much to bear and for close to 25 years I refused to go anyway near a dental surgery. Now in my forties it was obvious something had to be done and I was recommended Smile Cliniq in Finchley and St Johns Wood. From the outset Dr Chetan Kaher & Dr. Evdokia Chasioti seeing I was a very nervous patient, put my mind at ease with their kind words and professionalism. They clearly explained what was needed, completed the work to an exceptional standard and allowed me breaks when I needed them. I cannot fault the treatment I have received in anyway and while I don’t think I will ever look forward to a dental visit, the care I have received at Smile Cliniq makes a trip to the dentist a bearable necessity.